Don’t Miss Out—Less than a week away! 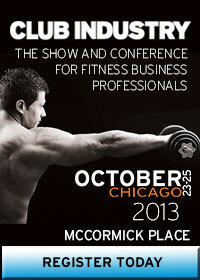 Are You Attending Club Industry In Chicago this week? Let me know and we’ll get together! Following are some great opportunities for you to participate in while attending this event! We have a special discount code just for W.I.T.S. friends and colleagues! Just follow the link below and when you register, use the promo code SAVE25, which provides a $125 discount on the full conference pass. While at the event, you’ll want to check out the “Business Program for Personal Trainers.” You’ll learn from the experts the secrets of sales, marketing and social media to insure your success as a business person! And while you are at the Club Industry Convention, we have a “MUST DO” event for those interested in the future of the fitness industry! Open invitation to all employers, trainers, educators and certification organizations. Why a meeting? We need to solidify and establish an industry wide image and policy to help support and direct our professional services. Much has been written about what “we” have come up with to meet legislative initiatives or to help obese children etc. Now you actually have a voice and a forum to formalize and legitimize our profession. Let me know if you’ll be there! I’d love to meet you! Next post: November is American Diabetes Month!